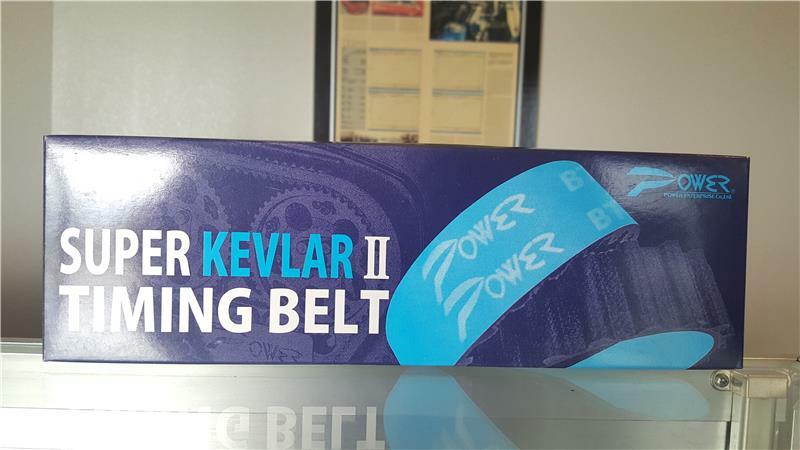 The pioneer of Kevlar timing belt Super strong KEVLAR timing belt was originally developed and patented by Power Enterprise. The original Kevlar timing belt developped by POWER in 1997 featured 4-times durability against stretching compared to the stock belts gained huge popularity among race engine builders and the most of race parts manufacturers. At end of 2006, PWR reintroduced further advanced Kevlar timing belt based on the feed backs received from engine builders of the world. The new Kevlar Timing Belt features Zero stretching, 2.6 times more durable compare to the original POWER Kevlar timing belt and increased in haeat resistance, improved in bending flexibility to surpress unwanted osilations. POWER Super Kevlar also improved mechanism of transition stage, perfect at fitting into camgear by compounding nylon fiver in the cog portion. Now It trains the camshaft with ZERO compromise. This is the Only Timing Belt in the world significantly exceeding stock performance and all other competitors are NOT exceeding stock quality. PWR challanges all competitors to compare their Belt.